Buy any participating MAGGI products (Pedas Giler / Hot Mealz / Hot Cup / Letup/Royale). 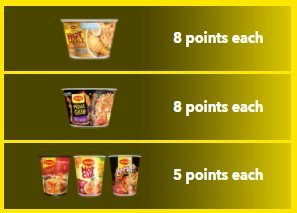 Collect 50 points with any combination of these MAGGI products (Pedas Giler/Hot Mealz/Hot Cup/Letup/Royale). Complete and submit the entry form, original receipt and product sleeve at drop boxes provided at selected stores. Complete and submit the entry form, original receipt and product sleeve to PO BOX 11, Jalan Klang Lama, 58700 Kuala Lumpur. Submit picture of the product sleeve, receipt, and contest form to MAGGI MALAYSIA Facebook Messenger. Note: Participants MUST keep their original product sleeves, receipt, contest form for winner verification and prize redemption. 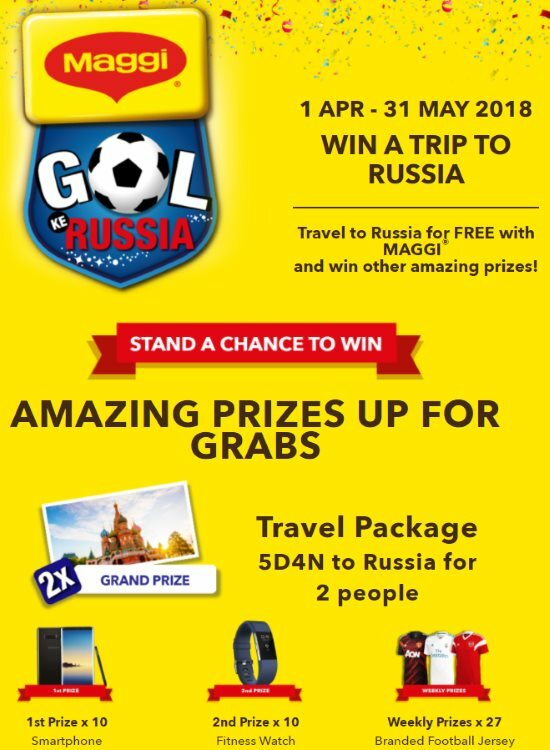 Visit Peraduan MAGGI Gol Ke Russia contest page for more details. Extra HOT promo: AirAsia GE14 special fixed rate promotion at RM99, RM129 & RM199!